Understand. I have a slight tremor anyway. It’s a side effect of the medication I take for my bipolar syndrome. And, I suppose, a natural consequence of getting older. But it doesn’t come close to preventing me from spending inordinate amounts of time poking this keyboard trying to turn out something that might grab your attention. And, understand further, that I’m a coward when it comes to spooky movies. On the first date with the woman who became my wife of what is now nearly 40 years, I, for some crazy reason suggested we see Hitchcock’s Psycho. Before the credits rolled, I was reduced to a whimpering mess, eyes closed, my head cowering behind her back. Why she consented to marry me after that display remains, to this day, a mystery. And then there’s the night before last. As is my wont when watching DVD’s, I was grinding away on the downstairs elliptical. Marleen was in the mountains, skiing with my sister who was visiting from Albuquerque. So it was just me and Disorder. In a quiet house with nightfall rapidly coming down outside. But by the time it was over, I was palsied like a leaf in a hurricane, barely able to get the disc back in its Netflix sleeve and rush it back to the outer darkness from whence it came. But . . . I watched it again a few nights later. I got to it, of all places, from one of my favorites, Far From The Madding Crowd. Matthias Schoenaerts is the common denominator: the strong, silent type. But in Disorder he’s a veteran- and victim-of one of our endless wars: the conflict in Afghanistan. His unsettling portrayal of the mood swings of a now body guard for hire suffering from Post Traumatic Stress Disorder was more than enough to keep me on the edge of my figurative seat while on the elliptical. And keep me glued to the couch when I otherwise would have climbed down from the elliptical and started doing sit-ups. But it wasn’t because I needed to see the subtitles in this French language film-the dialog doesn’t carry the show. It was far more that the long silences and the eerie sound track were punctuated by jump-out-your-skin sneak attacks as Schoenaerts defends co-star Diane Kruger’s creepy mansion from invasion. Even the last scene, which turned out to be perfectly benign, made my skin crawl the first time around. But as I said . . .
I’m a coward when it comes to scary movies. But I liked this one anyway. How Kruger slowly, grudgingly allows Schoenaert to earn her trust and respect. In part, because, he, a hardened soldier with plenty of issues of his own, unobtrusively shows her how to be a better mother to her young son. Over a bowl of cereal. But if fingernails-on-the-blackboard suspense isn’t your cup of tea, Disorder might not be for you. But I’ll give it this much: it made me come back for a second helping. A real, live white male hero? Not possible! I’ve watched it more times than I want to admit. But, as Sergeant Troy, the film’s anti-hero says just before he stops a richly deserved bullet to the heart, “Honesty in all things.” So. There you have it. Guilty as charged by my wife, who more than once has cast a wondering, skeptical glance my way as she goes up the basement stairs while I spin the elliptical, watching Far from the Madding Crowd yet again. I like Carrie Mulligan as the impetuous, strong willed Bathsheba Everdene. And Mattias Schoenaerts as the wise, steadfast Gabriel Oak. I like the marriage bond that finally unites the two. I like that, right from the outset, “a baby or two” is recognized as the natural and desired outcome of marriage. I like the defiant heterosexuality. And the picture’s equally defiant sexual modesty, even prudery. I like the gentle, English countryside. And the Victorian conventions that bound it together. I particularly like that the film makes no effort whatsoever to appease the vast array of aggrieved minorities and pressure groups that Hollywood has seemingly come to believe are its primary raison d´être. But all good things come to an end. Especially after the furnace is stoked cherry red. But in due course, I’m confident the thrill will be back. And what’ll I do then? Climb aboard the elliptical. And watch it again. Even knowing each of it’s twists and turns. And which is something you might want to consider doing yourself. Until a few months ago, I had no idea what The Emerald Mile is. Or was. But my sister, as is her wont, helped straighten me out. So I listened to an unabridged version. And the book’s, indeed, a good one. The story of three crazed “river rats” who pulled off this hair raising feat by getting slingshot through the Canyon on the back of a raging Colorado River at the height of a hundred year flood is compelling. But the story of the record breaking run down the river is, in many ways, mostly a peg on which to hang the much bigger story of human interaction with one of our nation’s most iconic natural wonders. It’s a story that revolves around two polar extremes: the dam building, engineering geniuses who bent the Colorado’s raging spring floods to man’s purposes. And, in the process, turned the river into an enormous, usually docile plumbing system. At the other pole are environmental groups, with the Sierra Club in the vanguard, who eventually brought the dam building to a screeching halt. But not, of course, until after some of the Canyon’s most stunning features were submerged in watery graves. Much of the book is devoted to a history of the Sierra Club and it’s long time Executive Director, David Brower. It tells how the Club went from little more than an “alpine picnicking society”, to, under Brower’s leadership, an organization espousing a militantly environmentalist, anti-immigration agenda. And then, because of strings that were attached to a gift of more than $100 million from David Gelbaum, a pro-immigration, Jewish oligarch, the Sierra Club reverted to its picnicking club roots. When he made the contribution, Gelbaum told then Sierra Club director, Carl Pope, that “if they ever came out anti-immigration, they would never get a dollar from me.” Pope, like an obedient lap dog, laid down and gratefully licked the hand that fed him. See here, as well, for the story of how Gelbaum upped his purchase price for the Club to $200 million. And how the Club has come out for virtually unlimited immigration. He [Brower] also criticized the Sierra Club leadership for not taking a stronger position against increased immigration into the United States, which in 1998 was the subject of a divisive internal debate over club policy. BS talks population control. And money walks. When I was in the Colorado legislature, on two occasions I ran bills that would have mandated that all Colorado employers use the E-Verify system to assure that job applicants are legally eligible to work in the U.S. Illegal immigrants, of course, are usually drawn to this country for jobs. On both occasions, Colorado environmental organizations opposed E-Verify. Why? Because, according to Pam Kiely, an environmental lobbyist, “We have to control world population first. Then deal with the United States.” (Environmental groups, like most organizations with similar interests, run in packs. The Sierra Club was one of the pack. Pam was speaking for the Club). Pam’s logic doesn’t pass the smell test. Why? Because the U.S. has the fastest growing population of any industrialized nation in the world. America accounts for all population growth among advanced countries. And by 2050 we’re likely to add over 110 million people. Imagine what 110 million more people will do to your commute. The price of housing. The pressure on our national parks. And virtually all of that is attributable to immigration; the native born US population has stabilized at the replacement level. Well, Pam, good luck with that strategy for controlling the world’s population. I can just see the Club lecturing countries with sky rocketing populations like Oman, Niger and Tanzania about getting their population houses in order. While ignoring what population growth and immigration is doing to the Sierra Club’s own country. And the world’s population grows from our current, astounding number of over 7 billion. To an unfathomable 11 billion by 2100. So, Sierra Club members, party hearty on your exotic cruises. And keep buying those coffee table books. While your bought and paid for leadership ignores America’s mushrooming population. And the tides of immigrants continue to lap up against the shores of places like the Grand Canyon, Yosemite, Yellow Stone, and the Grand Tetons. Not long ago, I had lunch with a couple of guys I know well enough to say with confidence that they’re both politically conservative and active outdoorsmen: my brother and brother-in-law. But when I brought up immigration, we parted company. At least in part. But isn’t legal immigration fine? “During debate on the Senate floor, Senator Kennedy, speaking of the effects of the act, said, “our cities will not be flooded with a million immigrants annually. … Secondly, the ethnic mix of this country will not be upset”. How wrong Kennedy was. Although native population growth has tapered off at the replacement level, explosive immigration levels, combined with chain immigration, illegal immigration, and the high rate of births to immigrants, have caused the US population to soar. “Not be flooded with a million immigrants” a year? How about more like two to three million. The 1965 bill was sponsored in the Senate and House by leading Democrats. When it came up for a vote in Congress, only 74% of Democrats supported the bill while 85%, of Republicans voted for it. What’s up with this? Two things. First, southern Democrats still exercised a disproportionate share of legislative influence by sticking together under the skilled leadership of Richard Russell of Georgia and his crafty use of the Senate filibuster. Russell understood the long term impact of the bill. And couldn’t care less that opponents branded southerns as “racist” for refusing to support the legislation. Russell foresaw that the Act was going to make ours a nation with a large component of virtually pre-industrial, Third World people that would be bitterly divided between the haves and the have nots. So, southerners voted “No”. And, second, most of the Republicans who supported the bill probably didn’t understand the complex and longterm ramifications of the legislation. And what is equally likely, even those Republican who did understand what was being done, were unwilling to be associated with those benighted, racist southerners. Is immigration a suicide pact? And now, with so much of the nation, including a preponderance of the Democratic party, in the fevered grip of identity politics, what is the likely fate of white people who, in only 20 short years, be a minority in the nation their forefathers founded? Will whites be afforded the minority protections that an overwhelmingly white, male political class granted to minorities when whites were in the majority? Things like affirmative action? And the Voting Rights Act? Surely you jest. Or is it more likely that minorities will double down and, using their new found majority status, pass reparations legislation that would force whites to compensate them for injuries and grievances that, in some cases, are centuries old? And, on top of this, continue to demand preferential treatment under existing civil rights legislation. In which case, when does the dwindling white beast of burden simply collapse? 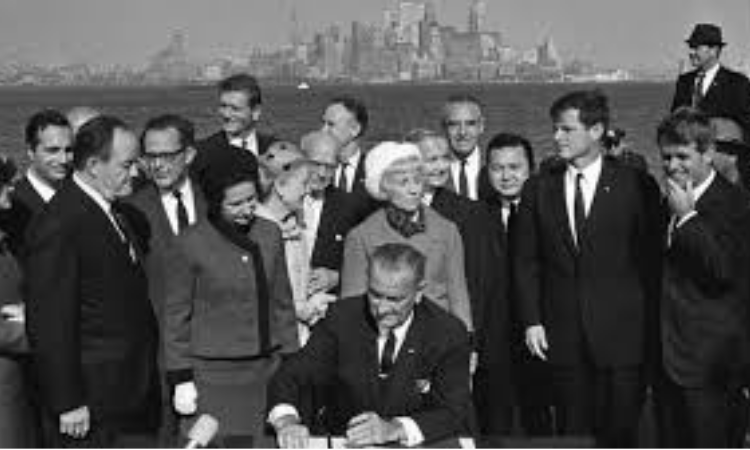 When the ’65 Immigration Act was signed by President Johnson, America was still in its post World War II, imperial glory days. But no empire is eternal. Including the American empire. And the truism that “the bigger they are, the harder they fall,” remains true. Because as an empire metastasizes, it assimilates increasingly dissimilar, indigestible, and resentful populations. Think of the Romans and restless barbarians that eventually sacked the Eternal City. The British Empire, on which the never set, but to whom the American colonies gave the boot. And, yet more troubling, the polyglot, dysfunctional, and even dangerous city that London has become with uncontrolled immigration. Now, the American empire, with a tip’o the hat to Teddy Kennedy, has replaced its formerly homogeneous populace with a Tower of Babel of fractious races and tongues. Thus, the illegal immigrant caravans storm our southern border. While President Trump jawbones the wall rather than actually building the wall. Speeches that are probably meaningless now that a divided Congress can’t even agree on keeping the government open. Much less fund the wall. Speeches that are more like fiddling rather than the “big, beautiful wall” we were promised. And which wall may very well go up in smoke.